PHASE 1 - We Link Up and start Working Together towards the common good of all people. Our world is facing some serious international crises and the reality is simple - we need to work together to fix them. For decades, the humanitarian sector has struggled to cope with the challenges that result from a world that is in competitive conflict with itself. Today - There are literally thousands of humanitarian groups and organisations trying to help make a positive difference in the world, and many millions of people actively involved - Action Aid, Amnesty International, AVAAZ, Christian Aid, Free World Charter, Greenpeace, London College of Spirituality, Occupy Movement, Oxfam, Red Cross, Simpol, TEAMHUMANITY, Unicef, VocalEyes, VSO, WaterAid, World Vision, WSPA, Venus Project, The Zeitgeist Movement...to name just a few. Every group often has to overcome a great number of challenges to make a difference. This may involve - Political Obstructionism, Government Corruption, Corporate Self-Interest, Public Apathy, Fund-Raising challenges, Personal Time Constraints, etc. Considering that people in the humanitarian sector all share common values and goals, doesn't it therefore make sense to 'link up and work together' to achieve them? We all know that it's possible to address the world's problems - but it's also essential, that we are prepared to work together to help make that happen. To LINK UP - Follow these 2 steps. Insert one or more links on your website home page, meetup site and/or social media page. Ideally, if it fits in with your website design, the 'social media icon' would be our preferred choice to help create greater social awareness. If we all start to link-up with this icon, it will become a 'symbol of our commitment to true unity and cooperation in the world'. View this website - at the top of the page - as an example. It's simple - Just copy and paste the HTML code below into an appropriate sentence on your website home page, meetup site and/or social media page. 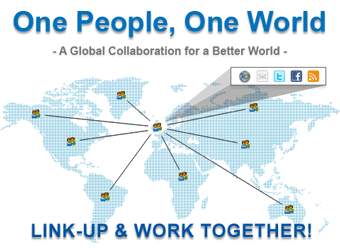 Adjust the words: 'Working Together for a Better World' - if you wish, as long as the general message remains about the same. For example - 'Proudly Supporting all who work together for a Better World', 'Supporting Global Unity and Cooperation', etc. Just copy and paste the following HTML code into an appropriate icon location on your website home page, meetup site and/or social media page. View this site - at the top of this page - as an example. And you can contact us if you would like a social media icon designed to a different size or specification. If you'd prefer the icon graphic to be accessed from your own web server, right click and save it; then upload it to your images folder and change the 'img src' path to your own web server images location. Once you've completed STEP 1, simply complete this form - and we'll do the rest! You are always free to make updates and changes to your links or information at any time. Once we receive the following details, we will contact you, and start promoting what you do. What quote/phrase defines what you're all about? Max 100 characters. Describe what you do and what your objectives are. Max 300 characters.